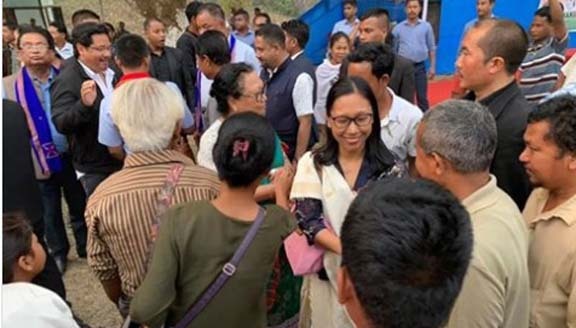 NPP on Monday kick started its campaign for the 17th Lok Sabha election with a brawny note in the party’s stronghold in Garo hills of Meghalaya. Presenting his youngest sister, Agatha Sangma as the candidate from Tura constituency, NPP President and Meghalaya Chief Minister Conrad K. Sangma said he is 100 per cent confident that his party is going to win the election with a big margin. “My father, PA Sangma served the Northeast, and the last 40 years, he served in different capacities, and brought development in Garo Hills,” Conrad Sangma said, adding that people of Garo Hills and entire northeast loves him. “We have listed all his dreams and plans, and are working hard to implement those for development of the Garo people,” Conrad Sangma said, adding that his government in Meghalaya has initiated major steps for development of the education sector. The NPP chief said his government introduced big centrally-sponsored schemes in Garo hills, and many more development projects will be implemented on a priority basis. “If we have Agtha Sangma as our MP, she will be able to work for development of Garo hills because she knows everyone in New Delhi,” Conrad Sangma said, adding that she was a former union minister. Agatha Sangma promised that she will follow her father’s footsteps. “I will not let you down and will be the voice of Garo Hills and the region,” she said.